Every man who served in the Great War is now deceased, but they have left behind them an enormous collection of oral history, which captures the authentic voices of the front line soldiers. 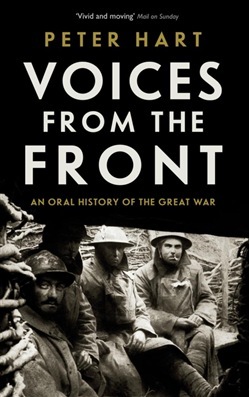 In Voices from the Front, oral historian Peter Hart brings together accounts from across the conflict, from soldiers, sailors and airmen, from officers and privates alike. In the course of his research, he talked to men who saw their friends die in front of them, who were seriously wounded themselves, men who refused to fight on principle and those whose indomitable spirit carried them through thick and thin. Sometimes they were there at crucial turning points in the war - going over the top in the slaughter of the Somme in 1916 or punching through the German lines to victory in 1918 - and sometimes they sweated, toiled and suffered on a forgotten front, thousands of miles from home. In the vein of The Beauty and the Sorrow, this is the First World War seen through the eyes of the men who experienced it for themselves. Acquista Voices from the Front in Epub: dopo aver letto l’ebook Voices from the Front di Peter Hart ti invitiamo a lasciarci una Recensione qui sotto: sarà utile agli utenti che non abbiano ancora letto questo libro e che vogliano avere delle opinioni altrui. L’opinione su di un libro è molto soggettiva e per questo leggere eventuali recensioni negative non ci dovrà frenare dall’acquisto, anzi dovrà spingerci ad acquistare il libro in fretta per poter dire la nostra ed eventualmente smentire quanto commentato da altri, contribuendo ad arricchire più possibile i commenti e dare sempre più spunti di confronto al pubblico online.